Coming right back at you with the boom! 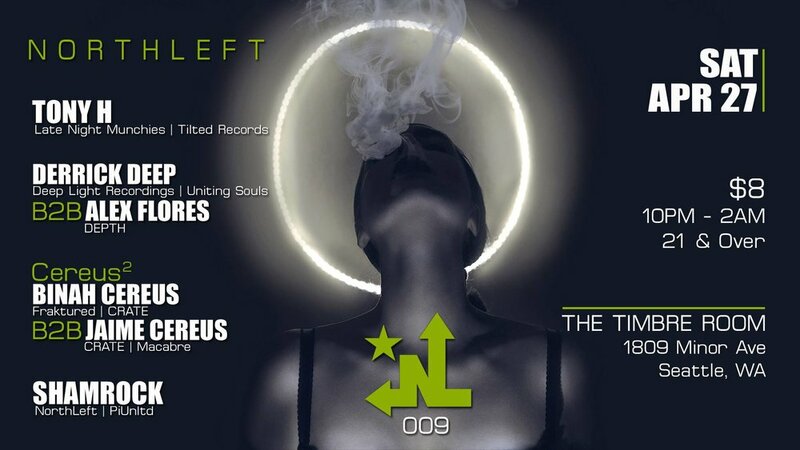 We are proud to present to you NorthLeft 009: New Forms. As you should know by now, we’ve always been a champion of everything dark and hard in the world of NW electronic music. We have also always been supporters and promoters of artists with new perspectives, that buck the status quo, that are a little of left the dial and who bring new forms of this music we all love so much to our city. NorthLeft 009 is a showcase of not only the deep, hard and raw which you’ve come to expect, but also a showcase of some of the best new voices of Seattle electronic music. We are once again packing a stacked lineup into four hours at The Timbre Room. We of course have the two mainstays of NorthLeft, Tony H (Late Night Munchies/Tilted Records) and Shamrock (NorthLeft/PiUnLtd), slamming you with their unique brands of heavily house influenced 4/4. We are also bringing back two of our favorite people and two of the best up and coming innovators of new forms of techno in Seattle, Derrick Deep (Deep Light Recordings/Uniting Souls) and Alex Flores (DEPTH), but this time B2B...If you haven’t seen this tandem perform live, it is not to be missed. And speaking of tandems, we welcome for their first NL show, Binah (Fraktured/CRATE) and Jaime Cereus (CRATE/Macabre), AKA Cereus Squared, doing a rare B2B performance combining breakbeats and hard techno.